TOKYO — Japan's Finance Minister Taro Aso has reluctantly apologized for saying childless people are to blame for the country's rising social security costs and its aging and declining population. 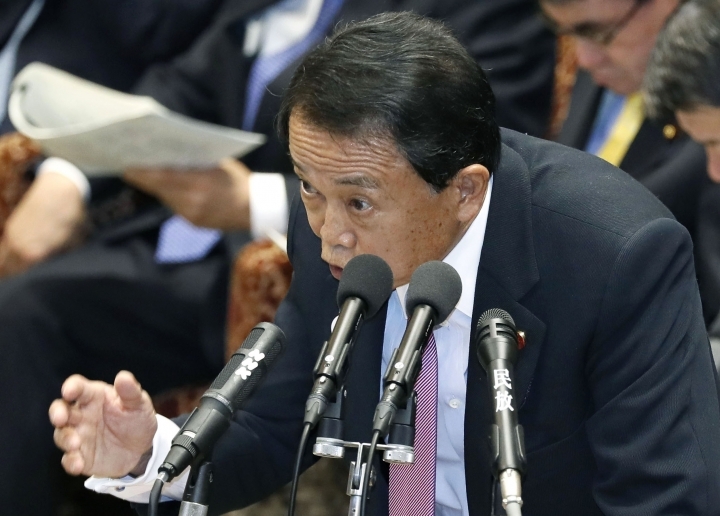 "If it made some people feel uncomfortable, I apologize," Aso said Tuesday after drawing complaints over a comment he made during the weekend at a seminar in Fukuoka, his constituency in southwestern Japan. The gaffe-prone Aso, a 78-year-old former prime minister, is among conservative lawmakers in Prime Minister Shinzo Abe's government who have at times blamed the elderly or childless for long-term demographic trends. The comment was nearly the same as one he made in 2014 that also drew criticism. Others have made similar comments that many found offensive. In 2007, former health minister Hakuo Yamagisawa called women "birth-giving machines." In 2017, another senior ruling party lawmaker, Akiko Santo, said the government should consider awarding women who produced four or more children. As of 2017, Japanese women on average gave birth to 1.43 children during their lifetimes. That compares with nearly 1.8 in the U.S. and Britain. Abe himself has no children. He has acknowledged that lack of access to affordable child care, excessively long working hours, elder care and other realities, especially in Japan's biggest cities, contribute to the country's low birthrate. But promised labor and other reforms to help alleviate the burden on families that discourage couples from having more children have made limited headway. Longevity in Japan is another factor behind the aging of its population and rising costs for elder care. Aso retracted his comment when asked about it during a parliamentary session on Monday. He apologized at a news conference following a Cabinet meeting on Tuesday, but said his comment was taken out of context and misunderstood. "He not only lacked consideration to those who choose not to or cannot have children, but he just doesn't understand what the problem is," said opposition lawmaker Kiyomi Tsujimoto, who belongs to the Constitutional Democratic Party of Japan, on Monday. "He has no sense of human rights." On Tuesday, Aso acknowledged his tendency toward gaffes. I'll have to watch what I say," he said.